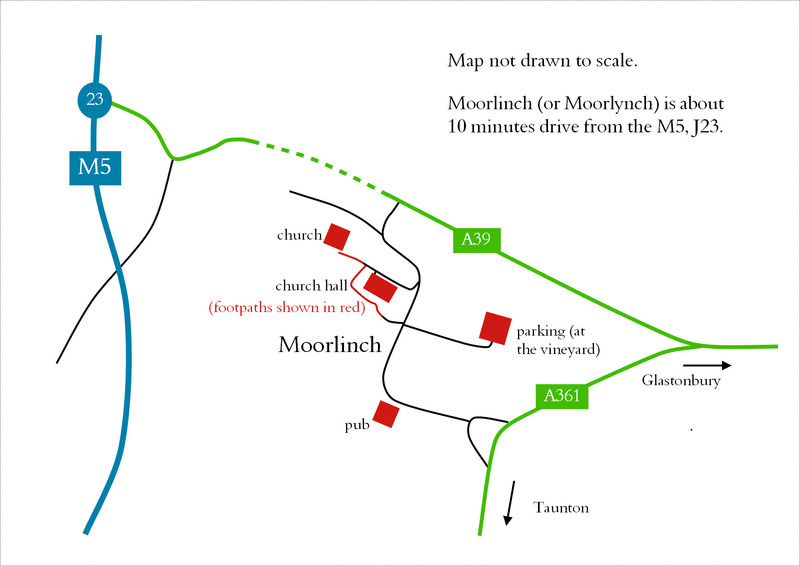 The village of Moorlinch is fairly easy to find whichever direction you come from, though there are no signs to tell you when you have entered the village, and most of the roads are not actually named! Leave at Junction 23, turning left (Eastwards) along the A39 towards Glastonbury and Street. After about 5 miles large signs indicate a turn to the village of Moorlinch to the right. Follow the minor road down into the village. The road bends sharply to the right, take a left turn into Spring Lane some yards after this. Drive past the long white building which is Spring Farm house on your left and into the car park on your left beyond this. As above but it is the third exit on the roundabout leaving the motorway. Take the A361 to Glastonbury, and about 4 miles after leaving the village of Othery take a turning on your left. This turning is signposted Moorlynch before the turning, but it also coincides with the start of the village of Greinton and a clearer sign saying Greinton is visible in the hedge at the start of this turning. Follow the signs into the village, and you will reach the pub, the ‘Ring O’Bells’. Follow the road round to the right and up the hill and Spring Lane and Spring Farm Arts are on your right. Leave Street along the A39 towards Bridgwater (Westwards). About 2 miles past Ashcott turn left to Moorlinch village. Follow the minor road into the village.